The iPod touch has a super-high-resolution Retina display, front-facing and back-facing cameras, an A8 processor and impressive multiplayer gaming. However, a GPS chip—seemingly so essential in today's portable electronics—is missing. Apple doesn't say why the company left it out, but it's likely because the iPod touch doesn't have internet connectivity when it's away from a Wi-Fi signal. Why does that matter? In order for many of the current crop of GPS navigation apps to function, they need always-on or nearly always-on connectivity. Many pull-down map information on the fly as you roll down the highway or along the trail. Navigation and location-aware apps also depend on connectivity to access information from search queries and databases. These apps are effectively useless without internet connectivity. There are several ways to use the iPod touch for navigation and location-aware services. You can even GPS-enable the iPod touch with the right accessories. Out of the box, the iPod touch is capable of significant location-aware functionality. As long as you're within range of a usable Wi-Fi signal, you can use real-time mapping and get turn-by-turn directions from point A to point B. The Maps app on the iPod touch lets you switch between standard views of maps, satellite images, and hybrids of both. The Maps app lets you tap to zoom, pan and change your view and shows you current traffic conditions as a street overlay. 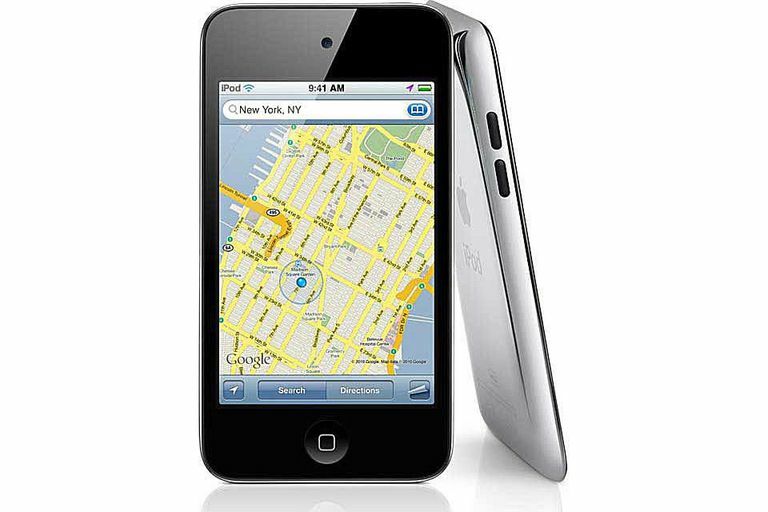 The iPod touch can also take advantage of a slew of location-aware apps that draw on Wi-Fi connectivity to locate you and your friends and show you views and reviews of businesses and services near your location. All that said, it is possible to add GPS functionality to the iPod touch. Each method is a separate device, not a software fix or internal adjustment to the device. Dual Universal Bluetooth GPS Receiver: Once this receiver is paired with your iPod touch, you'll be able to use it with hundreds of apps that require location information, including mapping and navigation apps. The receiver ships with a non-slip pad for use in a car and an armband for using the receiver when you jog, geocache, cycle, hike or enjoy other outdoor activities. The Dual GPS Receiver has an 8.5-hour battery. Users download the GPS status tool on the iTunes store for use with the receiver. It shows your location, information on how many satellites the device sees and the signal strength of each satellite, the battery level of the receiver and confirmation that the receiver is connected successfully to your iPod touch. Garmin GLO Portable GPS and GLONASS Receiver: If you plan to use the iPod touch for in-car, turn-by-turn directions, one way to add GPS to the device is to purchase a car mount with a built-in GPS chip such as the Garmin GLO Portable GPS and GLONASS Receiver with vehicle power cable. According to Garmin, the GLO connects to 24 more satellites than devices that rely solely on GPS. The GLO pairs with your mobile device using Bluetooth technology. The receiver has up to 12 hours of battery life for long trips, and an optional friction mount keeps the receiver on your dashboard and in full view of satellites. Emprum UltiMate GPS: The Emprum UltiMate GPS accessory for your iPod touch plugs directly into any iPod touch with a 30-pin connector and into an Apple-branded 30 pin-to-Lightning adaptor for newer iPod models. It is certified to meet Apple performance standards and has been tested with all models of the iPod touch. It is suitable for use with a car, bike, boat or plane and for geocaching, hiking, golfing cycling running and other outdoor activities. The accessory comes with the free UltiMate GPS app available at the App Store. Magellan ToughCase: If you want something portable for older iPod touch devices, check out the Magellan ToughCase for iPod touch. This device is a rugged and waterproof case for the iPod touch through the 4th generation. It includes a high-sensitivity GPS chip and supplemental battery to extend the iPod touch battery life.